The JUVE news blog has published a short interview with former Constitutional Court judge Prof. Dr. Siegfried Broß on the constitutional complaint against the UPC-ratification in Germany. Broß believes that the EPO Boards of Appeal are not independent from the EPO President and the EPO administration. He considers the recent reforms as being mere “cosmetics“. A further point was the unjust imbalance regarding legal measures against validity decisions. While a European Patent is retroactively invalid with a final invalidation decision of the EPO’s Boards of Appeal, the opponent can – if the EP is upheld by the EPO’s Board of Appeal – continue to attack the then national parts of the upheld European patent in national invalidity proceedings. Finally, Broß criticizes that the EPO would not commit to the protection of its employee’s fundamental rights guaranteed by national law and the EU Charter. A state transferring sovereign rights to a supranational administration has to safeguard that his nationals employed by such a supranational administration benefit from the same rights and standards as guaranteed by the German constitution. Prof. Dr. Broß strongly believes that these “fundamental constitutional deficiencies” have been overlooked and neglected during the drafting phase of the Unitary Patent Package. Regarding the timing of the proceedings before the German Federal Constitutional Court, Prof. Dr. Broß says that it would be possible to decide the case within seven months but that the matter is not urgent. Rather, the Court would have to wait for the result of the Brexit negotiations until it hands down a decision. 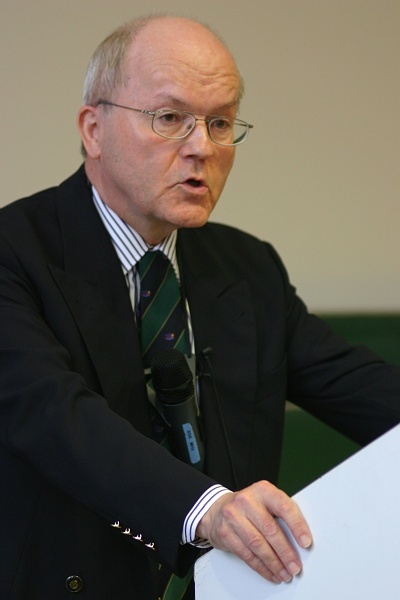 Keep in mind that while Prof. Broß is certainly a competent lawyer with high standing - he was a judge at the Federal Court of Justice for twelve years and at the German Constitutional Court from 1998 to 2010 - he has been retained as a party expert in the Mundipharma complaints pending before the Constitutional Court, and his views expressed above certainly are in line with the complainant's position. To my understanding, the complaint relating to the ratification of the UPC Agreement is not based on arguments relating to the EPO Boards of Appeal. This means that the remarks of Prof. Bross with regard to the EPO issues are not relevant for this appeal. Further, I completely fail to see how issues with the EPO Boards of Appeal could affect the UPC, which does meet all the standards for an impartial and independent court. On the other hand, if issues with regard to the EPO, which are brought forward in other complaints to the German Constitutional Court, would be relevant, that would relate to all European patents that cover Germany, not only to Unitary Patents. But still they would not relate to the UPC. As the IPKat mentions and I have also understood, prof. Bross is involved in such actions on behalf of an applicant. Regarding the imbalance, let's have a look at the German national patent system. "Anybody can oppose the grant of a patent within nine months from the publication of the patent specification. ..."
"Even after expiry of the opposition period, a patent in force can be challenged by an action for the declaration of nullity brought before the Federal Patent Court." So the German patent system is verfassungswidrig? One fact should not be forgotten, whether one agrees with Prof. Broß or not. The Unitary Patent is nothing more than a European Patent granted under the EPC. The competence of the EPO stops 9 months following grant, provided that there is no opposition. Just think of an opposition before the EPO against a UP. Why pay 20000€ in fees at the UPC, if in the first 9 months an opposition costs less than 1000€? This might be an important factor as the effect of an opposition is for all member states of the EPC, and not limited to member states of the UPC. Just a simple question: when dealing with an opposition on a UP is the EPO free to designate any member of staff, or should such an opposition be exclusively be composed of nationals of member states of the UPC, or at least from the EU? Before grant, or in case of an opt-out, the question is moot, but not after grant when the opposition is against a UP. It seems thus obvious that what happens in the EPO has an effect on the UP. That this is a Damocles sword hanging over the UPC cannot be denied. By the way, has the constitutionality of the UPC agreement ever been checked? What is the basis for claiming that the UPC does meet "all the standards for an impartial and independent court"? Whether the perspective of a decision or an opinion on the UPC by the CJEU might bring up some surprise, positive or negative, it will be difficult to escape it. It might have been wiser to have asked the CJEU its opinion about the UPC before pressing forward at any cost and any rate. All the discussions on the post-Brexit stay of the UK in the UPC could also have been avoided. Spot-on. For the reasons you mentioned, I would be surprised if the German Constitutional Court had not been requested to ask the CJEU for its position on the EU law issues involved. The powers that be apparently tried to avoid at any cost a new CJEU case on the UPCA before its entry into effect, even at the price of enacting a legally doubtful system. A word from the CJEU is now needed more than ever. It would be interesting to hear from Wouter Pors on which reasons the constitutional complaint is based and from which source he has his information. So far, I have not found any information on this point. As far, as the judicial character of the Boards of appeal is concerned, the structural reform is cosmetic in respect of the new own building. It preserves the status quo in respect of the integration of the Boards into the general administration of the EPO, e.g. Investigation Unit conducting disciplinary investigations under exclusive control of the President of the EPO, Human Resources, EDP Systems. The "reform" amounts to a substantial deterioration in respect of the personal independence of the Board members caused by the new elements of reporting connected with reappointment after 5 years based on reporting as well as payment based on reporting. The icing on the cake is the new rule that non-reappointed members are subject to a kind of non-competition clause. All this is a perfect system to prevent Board members from rendering decisions which might disturb the management to which the new President of the Boards of Appeal belongs. It will be interesting to see whether the suspended member of the Boards of Appeal will be reappointed. If not, this is the final proof that the EPO and its Administrative Council are willing to ignore the mandatory competence of the Enlarged Board of Appeal in suspension proceedings against Board members. First, a German authority cannot revoke the unitary patent, the EPO can and this without access to the UPC or any other court, an aspect carefully avoided by the ECJ in its decision on the Spanish complaint. Second, revocation proceedings in Germany are embedded in a judicial system of two instances, the Federal Patent Court and the Federal Supreme Court (BGH). In the EPO, judicial review is exclusively entrusted to the Boards of Appeal. Therefore, they have to meet the acknowledged standards required for a proper court. You seem to pretend to know the reasons underlying the constitutional complaint - or what is the basis of your "understanding"? If so, please do enlighten us. Whilst I have no idea whether they represent valid (constitutional) complaints under German law, the points raised by others about the connection between the UPC and the (well known) problems with the EPO certainly also appear to be "not wholly without merit". Thus, if those arguments do not yet form part of any complaint before the Bundesverfassungsgericht, would it not make sense for them to be added now (eg by way of a new complaint)? This might be a neat way of dealing with all of those nagging doubts that we are left with because of the absence of a CJEU opinion on the compliance of the UPP with EU law. Perhaps the BVerfG could also tackle the point that I have discussed with Tim Jackson on another thread, namely whether the UPC does (or does not) form part of the national legal system of EU Member States - and, if not, whether there is any legal basis for the CJEU to accept preliminary references from the UPC. By the way, whilst a lot of the above comments (regarding the question of compliance of the EPO with German constitutional law) have focussed upon avenues of appeal and the independence of the Boards of Appeal, we should not forget about the role played by the governing law, namely the EPC. For example, if German national law (and hence its constitution) incorporates EU Treaties, Regulations and Directives, do we also need to consider the question of whether the EPC is fully consistent with that body of EU law? As far as I can see, there are reasons to doubt whether the EPC is suitably compliant. If there is any deficiency in the administration of justice, it occurs when an EPO Board of Appeal that is in the pocket of the EPO President revokes a patent. As far as I know, until now there has never been any suggestion, ever since the EPO started in 1978, that any such Board is in any such pocket. That there are such suggestions now, to which anybody gives any credence at all, is exclusively the work of one man, a UPC-supporter, a man hell-bent on sabotaging the judicial function of the European Patent Organisation. Shameful! Until the present president of the EPO, there has never been any doubts about the independence of the Boards of Appeal. No president before the present one ever refused to propose renewals or appointments to the Boards, and all worked fine. In R 19/12, the EBA has shown that there are some problems with the independence of the BA, as the Chairman of the EBA was part of the management of the office. If the President had been acting in good faith, nothing like this would have happened. Moreover, the present president thinks he is above the law and has no respect for the separation of powers. By escorting a member of the BA outside the Office without a decision under Art 23, the separation of powers has been grossly disregarded. An attempt of the Administrative Council to request the EBA to confirm the the dismissal of said member has grossly failed. There again the separation of power has been grossly disregarded. First you ask the EBA and then you decide, not the other way round. The head of the BA Unit only holds the powers delegated to him by the president. If you call this independence, I do not. The blame is thus not only for the president, but also for the Administrative Council as it has supported all the measures wanted by the president. Both have proven totally ignorant of what forms the core of a democratic society in which justice has to be independent. It is to be hoped that the tree will on which all UPC proponents sit will be rattled and shaken. All those points will have to be thoroughly discussed before we end in a disaster. In French one would say: mieux vaut tard que jamais. Incidentally, rumors from within the office suggest that the concerned member of the boards is to be dismissed at the meeting of the administrative council, next week. This would be a disaster for the European patent sytem as a whole. German client comes to me with problem. Competitor French, owns European patent, litigated already in FR and DE. Guess what, he won in Germany but the Frenchman won in France. What will the outcome be in the court in England was his question. The HILTI case. Swiss patentee, litigates his patent all over Europe. Loses everywhere. Except in CH. There, he won. Surprise, surprise. American client visits. Its EPO patent is being opposed by his big German competitor. Client question: how can we win in DG3, given that two of the three judges on the TBA have German names? Can you blame him for asking? No wonder there is pressure for a UPC. It is just such a shame that some people have decided it is worth the price, namely, trashing DG3. So Wouter, as you chose to remain silent so far, can we assume that your pretended knowledge about the contents of the complaint comes down to nothing but yet another case of you tooting your own horn by spreading fabricated information? But at least you do seem to have a sense of humor when stating that the UPC “meets all the standards for an impartial and independent court”. Looks more like an exercise in whistling through the graveyard to me. In order to support "wild_guess", one could say that Mr Pors has, once again, missed an opportunity to keep quite. Now the matter has landed at the German Constitutional Court (BVerG), we should not forget that the BVerG is allowed to examine the matter on its own motion and dig much deeper as to the alleged lack of quorum in both houses of parliament. It is to be hope that it puts a question to the CJEU. Such a question should have been put to the CJEU before continuing. It would at least have brought certainty, I would even say "early certainty" (any resemblance ........). the authors, from Bristows, have brought out a possible constitutional problem in the UK. I appreciate everyone's comments here especially Wouter Pors' . What I find most amazing is that we are still all speculating as to the nature of the case. I ask my German friends if there is any prospect of any court papers being released before the judgement? Or will be just be left speculating for another 6, 7, 12 months? I find it ironic that Germany's supposed guardian of fundamental rights chooses to carry out its work in secret. If the issue is due to deficiencies with the BoAs then, tying the complaint to ratification of the UPC Agreement only makes sense if you view the Unitary Patent Package as giving rise to a new species of IP called the "Unitary Patent". I think that is erroneous reasoning. There are only European Patents granted under the EPC. A Unitary Patent is simply shorthand for a "European Patent with Unitary Effect" which is not new right, rather it is a new gloss applied to an existing right. Mr Pors is trying to capitalize on that tiny piece of information on the case that, most likely, a German colleague of his has managed to secure and has insinuated to him. And indeed, it would be surprising if the topic mainly discussed in the Juve interview with Prof. Bross played any role in the constitutional complaint, as it is difficult to see how the internal organisation of the EPO could be used as an argument for the unlawfulness of the UPCA under the German Grundgesetz. This may be different for the European patent with unitary effect an attack on which on the basis of the German Constitution would, however, be a completely different story. It is rather puzzling to see demands from several people, at least some apparently having a legal background, that the complaint should be made public, criticizing the BVerfG for alleged “secret proceedings”. Quite frankly, in which jurisdictions are court submissions made available to the public? If reference is now made to the “importance of the case”, let me ask you this: In proceedings at the CJEU, e. g. in cases C-146/13 and C-147/13 relating to the “patent package”, which information is made public about the submission of the parties? Three months after filing the requests are published in the Gazette of the court, usually four to five sentences, that is it. The reasons why knowledge of the submissions in a court case is limited to the court and the parties seem to be self-evident. The present, in most cases regrettably uninformed hysteria vividly underlines the legitimacy of this limitation. Tim H - whilst it might not seem that important to you, there is an important (and direct) link between the EPO and the UPP. For certain patents (EPs having unitary effect and not opted-out EPs), ratification of the UPP entails transfer of sovereignty from national courts to the UPC regarding the competence to handle certain disputes (for infringement, revocation, etc.). The transfer of sovereignty is immediate and irreversible for EPs having unitary effect. Thus, the registration of a request for unitary effect is directly linked to the transfer of sovereignty. Whilst I have no idea whether it forms part of the constitutional complaint, I would certainly understand if the BVerfG wanted to be persuaded that requirements under German constitutional law are satisfied by both the governing laws for the UPP and the bodies having key roles (connected with the proposed transfer of sovereignty) under that package. "Regarding the imbalance, let's have a look at the German national patent system. So the German patent system is verfassungswidrig?" No, because a patent applicant which got a refusal can also request a judicial review from German courts. With EPO-refusals, only the Boards of Appeal remain as remedy (except for conversions under Art. 135 EPC), the BoA may or may not be an independent judicial review as required by the german constitution. But if DG3 is the first instance to not grant a patent, what then? In my understanding, the "imbalance" is that an opponent in EP opposition proceedings after unsuccessfully going through the full EPO proceedings can try again in DE nullity proceedings. The opponent gets two shots and needs only one hit. As far as I know, it is not different for an opponent in DE opposition proceedings. I don't see why it should matter that DE opposition proceedings have one more instance. There is a difference in that both DE opposition proceedings and DE nullity proceedings are handled by the BPatG (and reviewed by the BGH). But is the BPatG/BGH in nullity proceedings in any way bound by the final decision in the DE opposition proceedings between the same parties on the same patent? Only if the BPatG/BGH is legally bound (to the extent that the facts are the same etc.) would I agree that the EP/DE imbalance is not present in the DE/DE system. But then, if the imbalance in the EP/DE system really is a problem, the solution is simple: make sure that the BPatG/BGH is legally bound in the same way by a final decision in EPO opposition proceedings. What on earth is the reason for all this discussion about the opposition procedure in Germany? "Appeals against decisions in opposition procedures can be lodged at the Federal Patent Court"
Assuming that the BPatG meets constitutional requirements in Germany, that's the end of the matter, isn't it? It seems to me Bross is arguing that even if the EPO boards were a court, the imbalance caused by the opponent getting two shots would be sufficient to render the EP/DE system as a whole unconstitutional. Now replace EPO boards with BPatG and the argument applies in just the same way to the DE/DE system. His other arguments also seem flawed. Whatever problem there may be with the EPO (or not), from a German national point of view it logically cannot affect the constitutionality of the UPC/unitary patent more than it affects the constitutionality of the EP/DE system. The role of the EPO is exactly the same in both systems. Anon - I had not understood the Professor's compliant to be based upon the mere existence of a "2 shots vs 1 shot" imbalance. Instead, my understanding was that the complaint relates to the imbalance in the number of unappealable (and unconnected) decisions. It is that imbalance which has the appearance of unfairness. Every "shot" ends in an unappealable (or unappealed) decision. I don't see a difference on this point between EP/DE and DE/DE. Let's have a look at the Juve interview. First, Broß states that there are "zwei wesentliche Voraustatbestände, die das EU-Patent und den UPC verfassungsrechtlich angreifbar machen". The first one is the alleged lack of independence of the EPO BoAs. "Außerdem ist die gerichtliche Anfechtbarkeit von Entscheidungen ungerecht für die Parteien: Während ein Patentinhaber, wenn sein Patent von den Beschwerdekammern widerrufen wird, keinen weiteren Anspruch mehr auf eine gerichtliche Überprüfung hat, kann ein Einsprechender, wenn er keinen Erfolg beim EPA hat, anschließend noch munter vor nationalen Gerichten weiter prozessieren." So the alleged problem here is the second shot that the opponent gets in national nullity proceedings. Placing another layer of review on top of the BoAs would not make any difference: once that has been exhausted, the opponent still gets another shot. So my point is that the exact same "problem" exist in the DE/DE system, which Broß conveniently ignores. Anon - it looks like either you just don't "get it" or you are being deliberately obtuse. In the DE/DE system, there is a single procedure to decide the validity of a patent. In that procedure, there is a single (final) decision on validity. Both the patent proprietor and the challenger have an equality of arms up to that point: the same avenues of appeal are open to both. In the EP/DE system, there are two procedures, namely the procedure before the EPO and the procedure before the national courts. Whilst there is an equality of arms within each procedure, there is a disparity when the two are connected in sequence. That is, the patent proprietor only gets a shot at the national procedure if he prevails before the EPO. Not so for the challenger, who always gets a shot. Do you get it now? This really isn't rocket science. From the "equality of arms" perspective, substituting the UPC for the German national courts does not make the situation any worse: it just maintains a disparity that already exists in the current system. In the DE/DE system there are two procedures to decide the validity of a patent. After losing a DE opposition, the opponent can file a DE nullity action. After losing an EP opposition, the opponent can file a DE nullity action. Quite similar, is it not? Of course the imbalance does not make the DE/DE system unconstitutional. Nor does it make the EP/DE system unconstitutional. Before which independent judicial instance can the proprietor of a European or unitary patent patent revoked in opposition proceedings challenge the revocation decision? Anon - apologies, I realise that I had been making a potentially unjustified assumption. Perhaps res judicata does not apply in the DE/DE scenario, even though the same court, the BPatG, would (if appeals are taken into account) have jurisdiction in both instances to decide upon the same matter (ie patent validity). I just don't know the answer to that one. What I do know, however, is that there is definitely no res judicata in the EP/DE scenario. The participating Member States shall ensure effective legal protection before a competent court of one or several participating Member States against the decisions of the EPO in carrying out the tasks referred to in paragraph 1. The "tasks referred to in paragraph 1" are tasks relating to the administration of requests for unitary effect by proprietors of European patents. Under Article 32(1)(i) of the Unitary Patent Court agreement, the UPC claims exclusive jurisdiction over "actions concerning decisions of the European Patent Office in carrying out the tasks referred to in Article 9 of Regulation (EU) No 1257/2012." Alternative reports have emerged in Germany about what the basis for a legal challenge brought against legislation passed in Germany to ratify the planned new Unified Patent Court (UPC) system in Europe is, an expert has said.